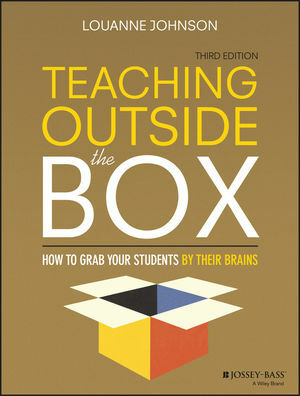 Teaching Outside the Box: How to Grab Your Students by Their Brain, Third Edition integrates practical strategies and engaging advice for new and experienced teachers. Whether you are preparing for your first year of teaching or have been working in the classroom for decades, this conversational book provides you with answers to the essential questions that you face as an educator—how to engage students, encourage self-directed learning, differentiate instruction, and create dynamic lessons that nurture critical thinking and strategic problem solving. This updated edition includes expanded material that touches on Project-Based Learning, brain-based teaching, creating smooth transitions, integrating Common Core into the classroom, and other key subject areas. Questions for reflection at the end of each chapter help you leverage this resource in book groups, professional development courses, and in both undergraduate and graduate classes. The art of teaching is one that evolves with changing educational standards and best practices; to be the most effective teacher possible, daily self-reflection is critical, along with a need to see things from a different perspective. This means we must step outside the box—moving our focus from 'fixing' the students when a problem arises to helping a teacher improve his or her practice. Teaching Outside the Box: How to Grab Your Students by Their Brain, Third Edition is an essential resource for teachers at any stage in their careers. LOUANNE JOHNSON is the author of nine books about education and the YA novel Muchacho. She is the author of The New York Times bestseller Dangerous Minds (originally My Posse Don't Do Homework). At present, she teaches high school full-time in rural New Mexico.